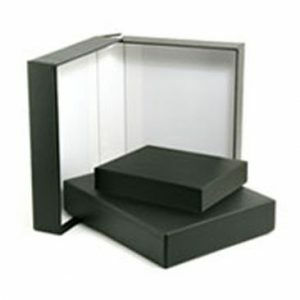 The acid free archival box is constructed of heavy weight acid free, lignin-free, non buffered board. The box opens flat so it is easy to organize items. The box is great for storing stitched items to ensure they are safe from acid leaching into the embroidery rotting it, which could happen if stored in non acid free containers. 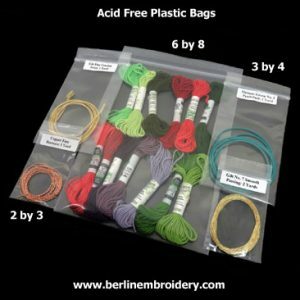 I have a several sizes in acid free plastic bags in which you can store embroidery threads, fabrics or stitched pieces. The opening of the bag has a zippered seal which you press to close. 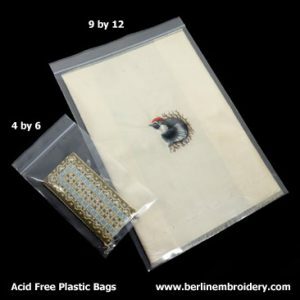 The 2 by 3 inch acid free bag is 2 mm thick, all other sizes of acid free bags are a sturdy 4 mm thick. What is the effect of Acid: If threads are stored in a drawer, box or tissue paper that is not acid free, over the years the acid in these materials seep into the threads and gradually rot the fibres. The museum quality acid free tissue paper is a must, to wrap stitched pieces, art work, embroidery threads metal threads and valuable fabrics in when storing them away to help curb acid migration and preserve non-replaceable heirlooms. 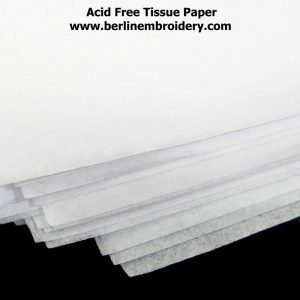 The acid free tissue paper is non buffered and lignin free.